Elvis’ voice doesn’t quite have the same ring to it as the King of Rock n’ Roll, but nevertheless, his words are music to the ears of those on a game drive in Ngala Private Game Reserve. The voice I speak of belongs to intrepid tracker Elvis Kubai, who had ventured off into the bush on foot some 15 minutes earlier, armed with nothing but a hand-held radio and two decades of experience in tracking wildlife. After making our way to his location, the sight of a young male leopard lurking in the undergrowth greets us upon arrival. We watch as the regal predator strides out into the setting sunset and surveys the landscape. Such a rare sighting sets the tone for my unforgettable three-day stay at Ngala, which is situated within the western boundary of the world-renowned Kruger National Park, adjacent to the Timbavati Game Reserve. Traversing an area of 14,000 hectares it is one of the richest wildlife regions on the continent. Tourists travel to Ngala to experience the game viewing drives in open vehicles. 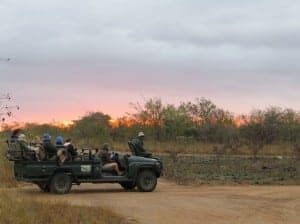 Before heading out on our first drive, we were warmly welcomed by affable field ranger Pieter van der Merwe, who provided us with a brief but thorough orientation of Ngala, and noted each guest’s animal viewing wish list. Leopards were at the top of mine, and with the help of Elvis, the ever-smiling ranger, my request was fulfilled on our first outing. In conversation later on, Pieter explained the importance of this working relationship. Once back at Safari Lodge, which serves as the main camp at Ngala, we were soon lured to supper by the twinkling candle-lit lanterns and crackling wood fires, which provided an idyllic setting for our first boma dinner. The staff at Ngala aim to keep you guessing by setting a new venue for supper each night – including a spine-tingling set-up in the bush, where you dine under a canopy of stars, with the sounds of nature providing the background music. All three meals per day are extremely well prepared, ensuring there is no chance of going hungry, although it was the array of buffet options at dinnertime that kept me going back for more. Every second night the guests are joined at dinner by their respective field rangers, and Pieter, who was never short of a story, kept us thoroughly entertained with tales of various African adventures, from being charged by elephants to nearly washing down a flooded river. After an early morning wake-up call the next day, it’s off on another game drive. This time it was the powerful grace of a herd of elephants that left me in awe, while the likes of zebras and wildebeests could be regularly spotted cantering across the bush savanna dominating the reserve’s flat terrain. 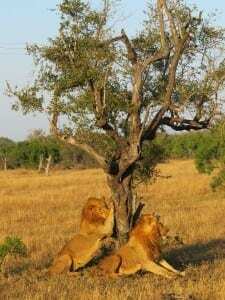 It quickly became apparent there was far more to Ngala than just the game viewing or big five experience. Ngala is run by leading travel company &Beyond, which owns and operates over 30 lodges throughout Africa, and has a keen focus on three core values: care of the land, care of the wildlife and care of the people. Conservation is seen as a top priority, and various steps are taken to minimise environmental impacts and maximise sensitivity towards wildlife and habitats at the various lodges. In partnership with social development partner Africa Foundation, the &Beyond Foundation also aims to empower the local communities through conservation and tourism. As Safari Lodge manager Stephen Smith explained, Ngala enjoys regular interaction with the local Welverdiend Community, where they have “worked with, not for” the community in order to help foster positive healthcare, education, employment and skills development. Ngala also puts into action various eco-sensitive practices, such as recycling initiatives, reducing energy consumption, efficient water usage, and making use of local produce as well as biodegradable products. Clearly, &Beyond has recognised ensuring the satisfaction of their guests is paramount to sustaining their business, and consequently the wilderness areas they protect. The Tented Camp, which overlooks the seasonal Timbavati river, and was recently rebuilt after being washed away during floods last year, accommodates 18 couples in nine luxurious air-conditioned safari tents, providing the sort of privacy which makes this the lodge of choice for many honeymooners. At Ngala’s Safari Lodge, 20 quaint one-room cottages and the luxurious two-bedroom Safari Suite cater for no more than 45 guests. With over 100 staff employed at the camp I came to feel very much a part of the Ngala family. Various activities are always on offer, and one must-do is the guided bush walk, which provided a wonderful way to appreciate the often-overlooked aspects of the reserve, including butterflies, birds or trees. 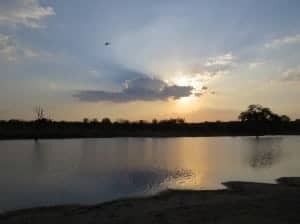 Interestingly, Ngala was the first private game reserve to be incorporated into the greater Kruger National Park, and in true form, a percentage of the profits from the Safari Lodge and Tented Camp flows into the National Parks Trust to further conservation projects. Ngala is in fact the Shangaan name for lion, yet as I entered the final day of my stay, it was the one “big five” animals which managed to elude detection. However, a majestic pair of young male lions basking in the early morning sunlight would provide the perfect start to our final game drive. Although nothing could beat the send-off delivered a couple of hours later by a pride of insatiable lionesses feasting on a kill. But perhaps Pieter summed it all up best when he suggested: “Ngala really is a hidden gem”.